I have a chair that needs some love. My mom found it at a garage sale years ago, and she gave it to me about five years ago, and it’s ugly. It is crying out to be upholstered, but I just can’t afford it right now and it’s not a chair that I would want to try upholstering myself. The truth be told, I love this chair. It’s solid, it’s heavy, it’s well made, it’s actually comfortable, and it’s got a great shape. The problem is the fabric on it is horrible. 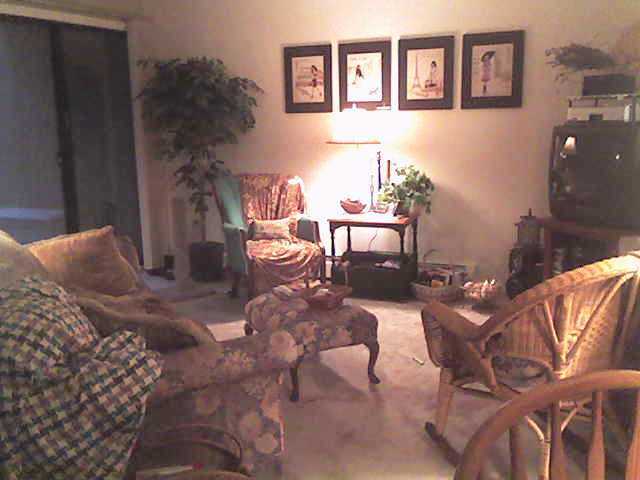 See the green chair draped with a throw? That’s my chair. As you can see in the picture above, it was a horrible color. The fabric is kind of a green burlap. It collects cat hair like crazy. But again, it’s a great chair. It has potential. The picture is from my the apartment I lived in before moving in with Jim…every time I look a pictures from there, I miss all the space I had. (heavy sigh) Anyway, since the fabric on the chair was so ugly, I always draped a blanket over it hide it as much as possible. Se the black chair with the throw tossed over it and a pillow? That my chair. Not long before I moved out of my apartment, I bought fabric spray paint and painted all the fabric black. I also painted the wood black, and replaced the trim that covers the staples with black trim. It looked better, after it was painted, it collected cat hair even more than it did before. So the throw was used to keep the cat hair off it more than it was to hide the chair. Here’s a close up of it. I painted the wood white to highlight the shape a little more and give it a little interest. I need to sand it off and do it over, because it’s not a very good paint job. But do you see what great lines this chair has? I love the detail on the back. It just has a gorgeous shape. Well, this weekend I did something I had been thinking about doing. I stenciled it, and now I can’t stop looking at it. Even though it still needs to be upholstered, I’m really happy with it. Here it is! I think it turned out pretty good. Let me tell you, it wasn’t as easy as I thought it would be. I used a plastic stencil, and it didn’t want to stay curved with the contour of the chair. I tried taping it down, but the tape kept coming off. Finally, I just had to accept that it wasn’t going to be perfect and that maybe the imperfection would be better any way. At first I was going to do the small stencil all over, but once I finished the back, I knew that would be too much. So I pulled out the larger matching stencil, and had the arms and seat finished in no time. Now, just because I like to have pillows on chairs, I have added a pillow to it. The brown pillow helps balance it with the rest of the room. Our sofa is black leather, and Jim’s recliner has a brown slipcover on it. So…what do you think? Do you think it will pass until I can get it upholstered? PrevPreviousChalkboard inside the kitchen cabinets!